CLIP IN EXTENSIONS: Why ever girl should have them!!! Time for a little SECRET SHARING !!! 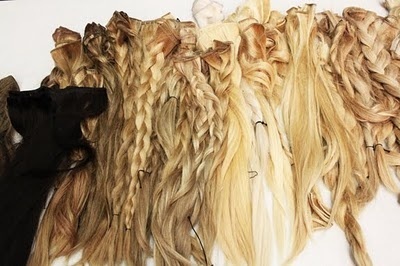 Clip in Extensions you may think are just used to create length and fullness. But why stop there! Let me share a little secret with you all. How about using them to create a braid or fishtail...etc. in a matter of seconds! I use clip ins ALL the time with my brides to add fullness, length, or for example a super thick braid which they may not be able to achieve with there own hair type! So why not have your own personal hair braids, fishtails, knots, in clip in form on hand for any given time you need them! This will quite frankly make your lives a WHOLE lot easier! I don't know about you, but if there is anything we can do to simplify something....sign me up!! 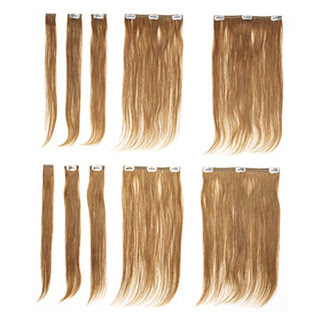 The image below is what a normal pack of clip in hair extensions looks like. Euronext Collection from Sallys is what I would recommend. They are already made with the clips in them and fairly easy to find, being in a Sallys Beauty Supply and all. Depending on how thick you want your braid to be I would double up the 2 smaller clip ins that have only one clip on them. I went ahead and made 3 different one's so you can see what it looks like. Then just add a clear elastic to the end when done! and you are set! Below are some picture examples of hair styles you can use these little gems for!!! clip on side of your head then use a bobby pin on the other side to secure. Put your hair into a messy bun then attach clip in and secure other side with a bobby pin again. Pull your hair into a side messy pony then add clip ins to the top of your pony tail and secure at ends with elastic. Make a top knot. then secure clip in at base of top knot, wrap around a secure. Your options are endless! Get creative and try some new styles! Hope every one has a fun and safe super bowl Sunday! !